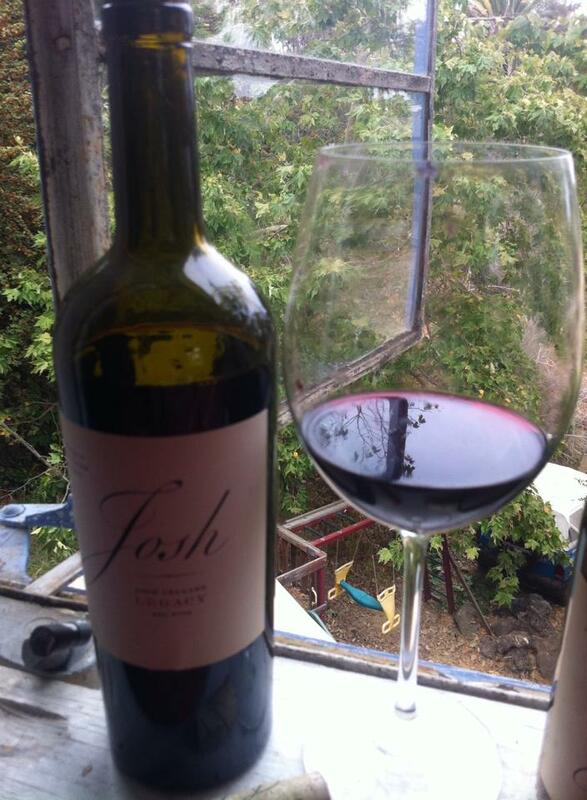 In time for Father’s Day are some notes about three wines from Joseph Carr’s second label, Josh Cellars: 2012 Chardonnay, 2012 Pinot Noir, and the 2012 Legacy, a red blend. The label also supports social causes. As the original Josh was a veteran, last November and December, with every bottle bought, the brand donated $1, up to $50,000, to Operation Homefront to reunite military families during the holiday season. Retailing in the $12-17 sweet spot with the Chardonnay currently on sale at Vons for less than $10, if these three wines represent the label, they will be a solid go-to choice for people at the grocery store looking for a nice wine to pair with their dinner. In fact, according to this fact sheet, the Cabernet Sauvignon (which I haven’t tasted) is the fastest growing California Cabernet in the market. They are expected to sell a hald million cases of wine in 2014, and is expected to reach a million cases soon. First we opened the Chardonnay–on Chardonnay Day May 22. Helen was attracted to the label right away; in fact she picked it out of the Chardonnays I posted on Facebook, Twitter and in this Chardonnay Day blog post. Since Helen is a fiend for Chardonnay, has worked in retail and restaurants with wine, and recommends and buys a lot of wine for friends and parties, that is a good sign for the label. When salmon is in season, we eat it as often as possible, and as I love salmon with pinot noir, I opened the Josh Cellars pinot noir a few nights ago, and it paired well. This pinot noir is pretty to look at, accessible, pleasant, and offers decent complexity for this price point. I know lots of people who swear you can’t find a decent California pinot for under $20; honestly, this one tastes like a $20-25 pinot noir yet it’s priced at under $20, and goes on sale for less. It’s more cherry than the strawberry I tend to find in NZ pinot noirs, and heavier and oakier than most NZ pinots too. Alcohol is 13.5% and the closure is cork. My husband, who tends to prefer beer and cabernet, really liked this wine, and that may be because it isn’t as earthy as some. My husband’s favorite wine of the three by far was the newly added and recently released Legacy ($15) which I opened last night to pair with some pretty darn upscale burgers: 93% lean grass-fed beef, whole grain seeded buns, Rogue creamery “Oregonzola” blue cheese (handmade from sustainable milk), organic arugula, farmers market tomato. We also had new white potatoes from the Farmers Market coated in garlic, olive oil and rosemary from our garden which my husband cooked on the grill. I gotta say –this is not your father’s burger. At least not my father’s! It’s modeled after the burger at My Father’s Office in Santa Monica. And that is quite a Legacy! The Legacy Jose ph Carr named for his father was perfect: a proprietary blend of Merlot, Zinfandel, Syrah, and Petite Sirah, Sourced from some of the best vineyards around the state like Central Coast, Lodi, Sonoma and Napa, Legacy offers the best qualities of each in a medium bodied wine with nice deep ruby color (see above in contrast to the pinot noir! ), complexity, plenty of dark bramble and stone fruit, some herbs (mint, sage, rosemary), and some pizzazz. Speaking of pizzazz, it would be great with pizza or BBQ just about anything–tritip, mini-gourmet pizzas, lamb chops, even a pork loin. Bet it’d be tasty with ribs, too. Tagged at 13.9% alcohol, it tastes higher than that to me. It comes in a hefty, classy bottle with a cork closure. Warning: drink all the Legacy that day or put it in the fridge–it is not tasting as good today, and I’m afraid it’s already turning even though it was stored in a cool place with the cork and it was only two-thirds empty. I paired it with crackers and a Parrano Uniekaas (a hard cow’s milk cheese), a Beehive Barely Buzzed (cow’s milk with coffee and lavender on the rind), and a triple cream blue for wine thirty. So if you’re looking for a way to make your Father’s Day BBQ special, consider making some Father’s Office style burgers and pairing it with Legacy. Or if you’re going for salmon or chicken, try the Chardonnay or the Pinot Noir. Note these wines were provided as samples for review consideration.